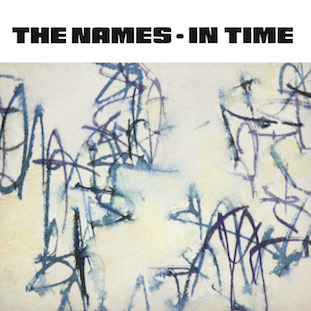 In Time is a new studio collection by acclaimed Belgian new wave group The Names, best known for their association with Factory Records and producer Martin 'Zero' Hannett. The 60 minute album gathers together selected tracks from two studio sets released by the group independently in 1997 and 2009. Like Swimming it features cover art and typography by Benoît Hennebert, and is in some respects a sequel to their acclaimed 80s debut, with the tracks split into contrasting 'day' and 'night' sides, mixing dynamic modern rock songs with longer, more melancholic tracks. Halloween In June is perhaps the best song Michel Sordinia has written since their sublime Factory single Nightshift in 1980, and features guest vocals from French pop polymath Isabelle Antena. In Time also features a heartfelt tribute to Hannett (Zeroes) as well as two songs by keys player Christophe Den Tandt, the lyrics of which reflect his time as a visiting doctorate student at Yale University. Cover by Benoît Hennebert. Photograph by Peter Staessens. Mailorder copies are delivered in special FBN slipcase.